Purpose: Large (≥ 5 cm) node-negative non-small cell lung cancer (NSCLC) is relatively uncommon; efficacy and toxicities of stereotactic body radiation therapy (SBRT) in this unique population have been under-evaluated. 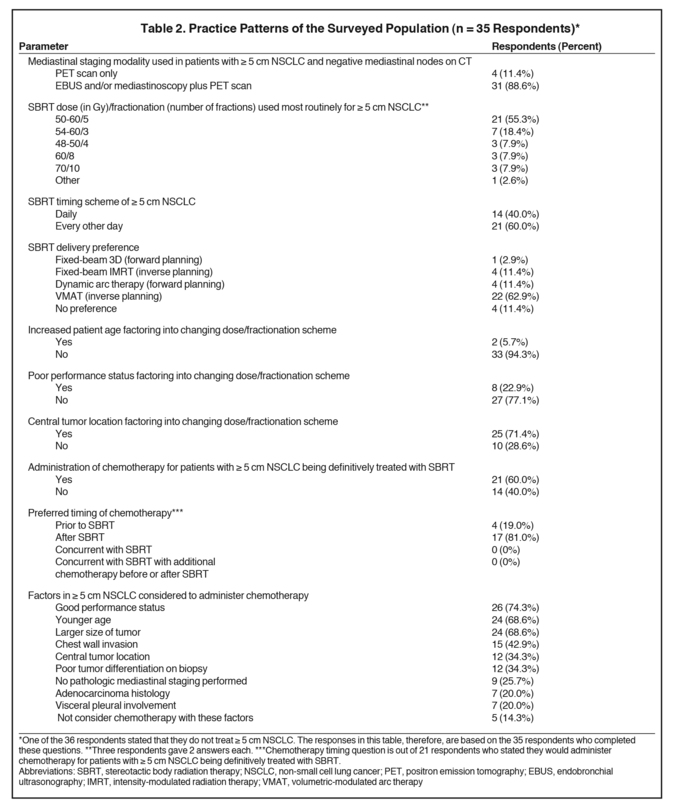 Methods and Materials: We surveyed U.S. academic thoracic radiation oncologists regarding SBRT practice patterns in node-negative ≥ 5 cm NSCLC and assessed factors necessitating changes in SBRT management. 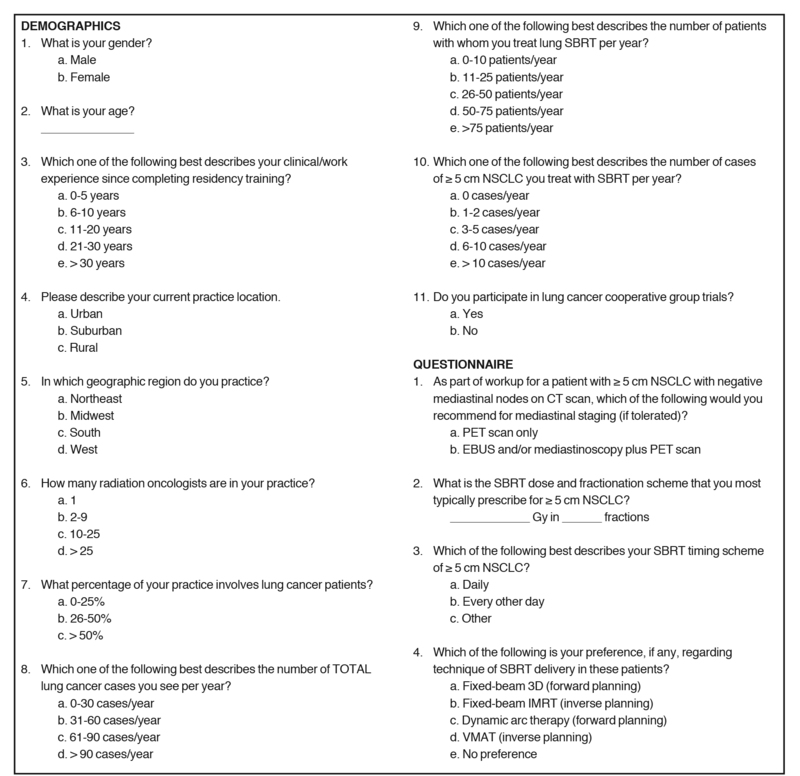 A 25-question survey of demographics and practice patterns, including 5 clinical cases, was sent to 107 radiation oncologists who self-identified as thoracic/lung cancer specialists. Results: Response rate was 34% (36/107). 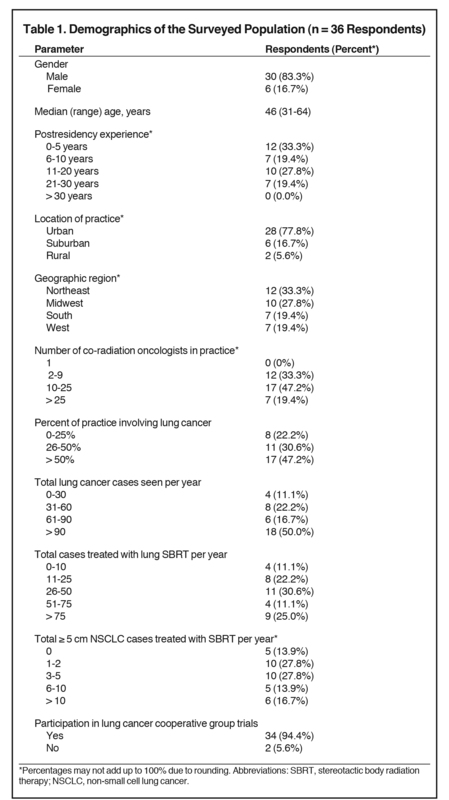 Among respondents, two-thirds had at least 6 years of work experience following residency; 67% and 67% annually treated > 60 lung cancer and > 25 lung SBRT cases, respectively. Nearly all (97%) routinely offered SBRT for ≥ 5 cm NSCLC, and 55% used a SBRT treatment of 50-60 Gy in 5 fractions, with fractions delivered every other day in 60%. Dosing/fractionation were most commonly altered for central disease (77%). Sixty percent would offer additional chemotherapy; chemotherapy was strongly considered for patients with good performance status (74%), younger age (69%), and larger tumor size (68%). The 5 clinical cases revealed significant practice variability in dose, fractionation, treatment timing, and chemotherapy use. 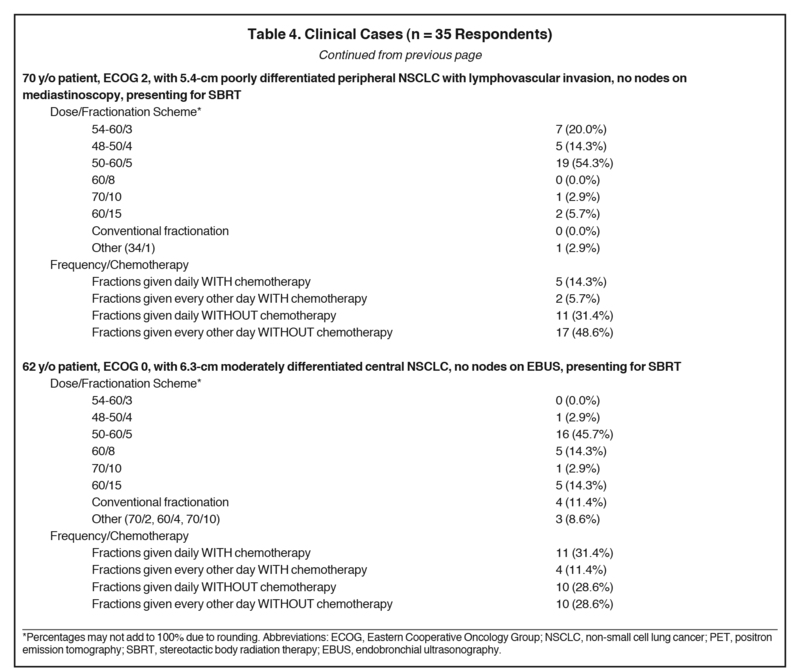 Conclusions: Practice patterns of SBRT for ≥ 5 cm NSCLC display substantial heterogeneity. Five-fraction regimens with biologically effective dose ≥100 Gy were most commonly performed, with common endorsement of every other day delivery and chemotherapy. Because of this limited data and lack of consensus, there is great heterogeneity in how these cases are treated in clinical practice, and many questions remain regarding practicality of several SBRT schemes in this population. Hence, we surveyed U.S. academic thoracic radiation oncologists to assess current practice patterns, and to determine which clinical parameters significantly altered their therapeutic decision-making for the treatment of large, node-negative NSCLC. We asked 107 thoracic radiation oncologists from 71 U.S. academic institutions to participate in a 25-question survey. All invited participants self-identified as specializing in thoracic and/or lung radiation oncology. A single thoracic/lung radiation oncologist was invited per institution in most cases; however, multiple radiation oncologists were invited for select larger institutions in which multiple providers specifically focus their clinical practice on lung cancer. The invitation contained instructions for participation and information regarding the study. The first invitation was sent on June 29, 2016. Participants who requested not to be contacted in the future were immediately removed from the database. The remaining respondents were contacted with a reminder email on July 12, 2016, to maximize response rate. No further communication with participants ensued. Responses were anonymous and were recorded with Google (N = 34) or Word documents (N = 2). 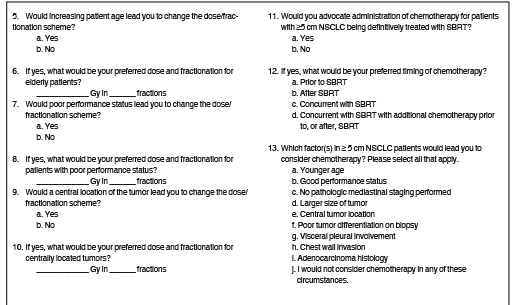 The complete survey (Supplemental Figure 1) was divided into demographic questions, clinical scenarios in which respondents commented on typical treatment preferences, and 5 clinical cases to assess dose/fractionation of SBRT and chemotherapy administration. Demographic questions addressed clinical experience, the nature of the clinician’s practice, and patient volume. Next, preferences on mediastinal staging modalities, chemotherapy use and timing, and practical/technical aspects of SBRT were recorded. Subsequently, various clinical scenarios were presented to assess whether each respondent would change management. Respondents selected from a list of several potential reasons for adding chemotherapy in addition to SBRT. Lastly, 5 clinical cases were presented that holistically addressed the previously mentioned parameters; respondents were asked to comment on their chosen dose, fractionation, and timing, as well as adjuvant chemotherapy usage. At the end of the survey period, responses were collated and tabulated. The overall response rate was 34% (36/107). Table 1 illustrates respondent demographics. Thirty-three percent had 0-5 years of work experience after residency, 19% had 6 to 10 years, 28% had 11 to 20 years, and 19% had > 20 years. Most respondents practiced in an urban location (78%), and they most commonly worked in the Northeast (33%) and Midwest (28%). Forty-seven percent were partners in a radiation oncology practice of 10 to 25 radiation oncologists, whereas 33% were in a practice of 2 to 9 physicians. Lung cancer patients comprised over half of the practitioner’s patient volume for approximately half (47%) of respondents, with lung cancer patients constituting 26% to 50% of the practice in an additional 31% of respondents. Half of the surveyed population saw > 90 lung cancer cases per year. Two-thirds of respondents (67%) delivered SBRT to at least 26 patients annually, with high volume providers (> 75 cases per year) accounting for 25% of total respondents. Most respondents (86.1%) had significant experience delivering SBRT to NSCLC tumors ≥ 5 cm, with 28% treating 1 to 2 cases per year, 28% treating 3 to 5 cases per year, 14% treating 6 to 10 cases per year, and 17% treating >10 cases per year. Of those surveyed, 94% participated in lung cancer cooperative group trials. Table 2 highlights the collective responses to the survey’s practice pattern questions. Eighty-nine percent used endobronchial ultrasound (EBUS) and/or mediastinoscopy in addition to positron emission tomography (PET) scanning as part of the initial staging workup. One respondent did not treat any NSCLC ≥ 5 cm with SBRT. Among respondents, 55% most typically treated ≥ 5 cm NSCLC with 50 to 60 Gy in 5 fractions, with 18% using 48 to 54 Gy in 3 fractions, and 8% each preferring 48 to 50 Gy in 4 fractions, 60 Gy in 8 fractions, and 70 Gy in 10 fractions. Sixty percent of respondents would deliver fractions every other day, whereas 40% would deliver fractions daily. Inverse planning with volumetric- modulated arc therapy (VMAT) was the preferred SBRT delivery technique for 63% of respondents, with the remainder generally split between inverse planning with fixed-beam intensity-modulated radiation therapy (IMRT), forward planning with dynamic arcs, and having no preference (11% each). Increasing patient age did not change dose and fractionation scheme for 94% of the surveyed population. Poor performance status, however, altered 23% of respondents’ dosing and fractionation schemes. With poor performance status, 3 advocated 5-fraction regimens (45-50 Gy/5 fractions), 3 supported modestly hypo-fractionated schemes (60 Gy/20 fractions, 60 Gy/15 fractions, 50 Gy/10 fractions), and 2 supported palliative-type regimens (45 Gy/15 fractions, 30 Gy/10 fractions). Central tumor location altered treatment dosing/fractionation for 71% of respondents, with treatment modifications listed in Table 3. 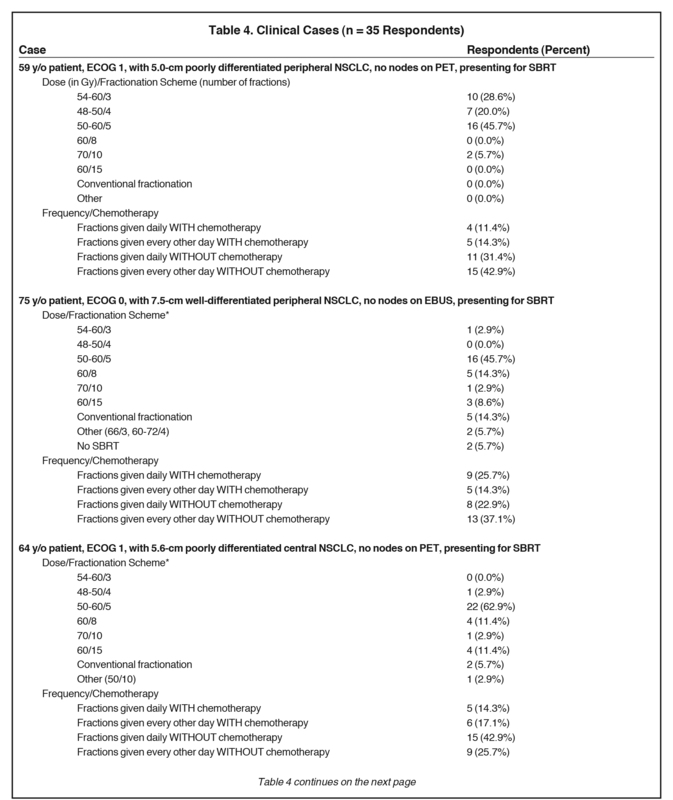 Sixty percent of respondents recommended chemotherapy use in ≥ 5 cm NSCLC patients being definitively treated with SBRT, with 81% and 19% preferring chemotherapy administration following and prior to SBRT, respectively. The factors most commonly reported as leading to consideration of chemotherapy included good performance status (74%), larger tumor size (69%), and younger age (69%). The responses to several other pertinent clinical factors influencing chemotherapy use are recorded in Table 2. Twenty-six percent would consider chemotherapy if no pathologic mediastinal staging was performed, and 20% would consider chemotherapy if there was visceral pleural involvement or adenocarcinoma histology. Five respondents (14%) would not consider chemotherapy regardless of any of the above-mentioned factors. The results of the surveyed clinicians’ recommended dosing and fractionation schemes in 5 clinical cases are shown in Table 4. Respondents offered SBRT for all cases with the exception of 2 respondents who refrained from using SBRT in case 2, the case in which the largest tumor size (7.5 cm) was depicted. A vast majority (88%) of respondents preferred the addition of EBUS or mediastinoscopy in addition to PET scanning for staging, despite little evidence to support that lymph node sampling improves outcomes in stage I-IIIA NSCLC.21,22 However, it must be recognized that large tumors, especially central ones, have notably higher risks of occult nodal involvement,23 likely explaining why respondents preferred lymph node sampling in this higher risk patient population. Despite this increased risk, a recent multi-institutional retrospective analysis revealed no improvement in tumor control (local, regional and distant) or survival with the addition of mediastinal lymph node sampling.24 Analysis to determine which subgroup(s) of patients with larger lesions that benefit the most from pathologic mediastinal evaluation is warranted. Among age, performance status and central tumor location, the latter was most commonly associated (71%) with a change in management by the surveyed population. 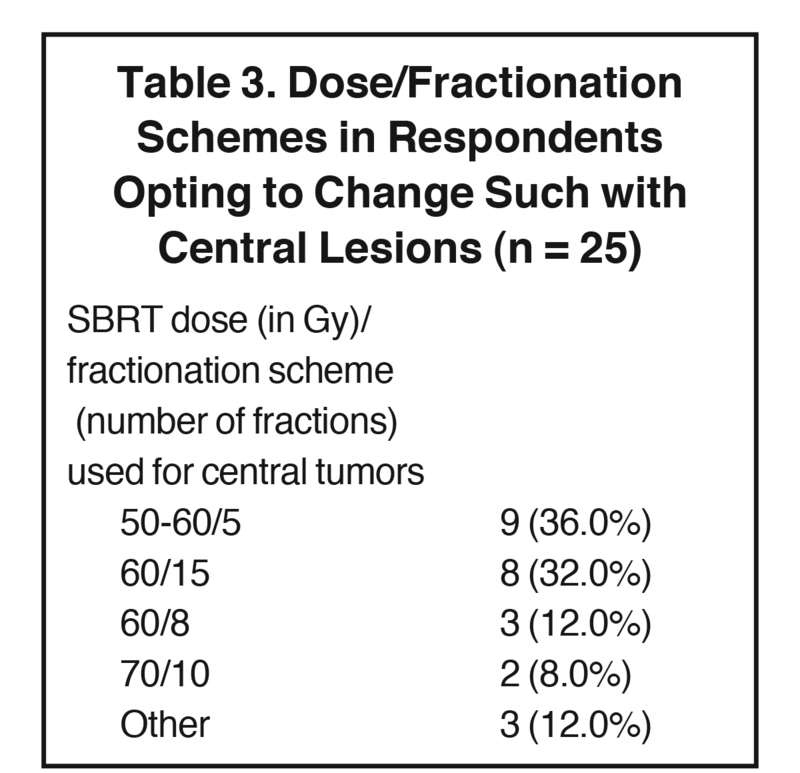 Of the 24 respondents who would change management, 11 (46%) switched from a classic SBRT scheme of ≤ 5 fractions to > 5 fractions. Given that prior reports of SBRT for lesions < 5 cm have demonstrated increased toxicity when treating centrally located lesions,31 and that treating larger tumors presumably has higher risks of toxicities than smaller tumors, this finding of switching fractionation schemes for central tumors is not unanticipated. Higher rates of toxicities have been reported for central lesions;16 however, more recent data suggest no toxicity differences based on tumor location.18 Additional clinical outcomes data are needed to determine whether SBRT of larger tumors is associated with higher rates of toxicities than for < 5 cm tumors, and if toxicity rates are higher in central lesions despite more widespread adoption of modern SBRT techniques. Responses to the 5 clinical cases further identified which clinical parameters altered SBRT treatment regimens and chemotherapy usage. SBRT regimens > 5 fractions were prescribed most commonly in case 5 (46%) and case 2 (40%), which presented a 6.2-cm central tumor and a 7.5-cm peripheral tumor, respectively. Regarding treatment timing, although 60% advocated this in the initial question, in no clinical case did > 60% of respondents endorse every other day fractionation. Administration of SBRT fractions every other day was highest in case 1 (57%), presenting a 5.0-cm peripheral tumor. In fact, the 2 cases with central disease showed the lowest proportion of respondents recommending every other day fractionation (43% and 40%), although these were least likely to receive 5-fraction regimens to begin with. Of note, a 3-fraction regimen was most common in case 1 (29%), a patient with a 5.0-cm peripheral tumor, and in case 4 (20%), a patient with a 5.4-cm peripheral tumor. Case 4 also displayed the lowest rate of chemotherapy administration (20%). In contrast, chemotherapy was recommended most commonly in case 5 (43%), which depicted a 62-year-old patient with good performance status and a 6.3-cm moderately differentiated central lesion. The responses to the cases differed from the generic practice patterns questions, clarifying that each treatment plan was indeed created on a case-by-case basis. Although this is the first survey of its kind assessing practice patterns for patients with large, node-negative non-small cell lung cancer, there are several limitations to this work. First, analysis is based on a limited number of respondents (n = 36). We limited the survey to academic thoracic radiation oncologists who self-identified as specialists in lung cancer to target a study population of providers who are most experienced in treating large node-negative NSCLC with SBRT. Fortunately, we do note a considerably high response rate among the total population surveyed (34%). Additionally, participation bias likely exists, as providers with more experience treating large tumors may have been more likely to complete the survey. As such, our results may not be representative of the practice patterns of SBRT in this unique patient population among the radiation oncology workforce outside of U.S. academia. Also, as in all surveys, wording of questions and limited space to offer a comprehensive clinical vignette or response options provided in the survey may have inappropriately simplified the complex nature of treatment planning in this challenging patient population. For instance, to simplify the wording of the survey, we did not acquire each respondent’s dose/fractionation SBRT scheme simultaneously with dosing frequency, as we did for the clinical cases, and we instead used 2 separate questions to obtain this information. Lastly, when we assessed for chemotherapy usage in the cases, it was presented in a binary manner, which may have influenced respondents to not choose chemotherapy if they could not also dictate when it would be administered in relation to SBRT. There are no current recommendations regarding SBRT for ≥ 5 cm node-negative NSCLC. Most commonly, respondents advocated treatment with 50 to 60 Gy in 5 fractions using VMAT, with fractions delivered every other day. However, substantial variability existed across treatment parameters. Central tumor location prompted most respondents to adjust their SBRT management, with roughly half adopting a > 5 fraction regimen. Chemotherapy was recommended more often in patients with good performance status, younger age and larger tumor size. Ettinger DS, Akerley W, Borghaei H, et al. Non-small cell lung cancer. J Natl Compr Canc Netw. 2012;10:1236-1271. Siegel RL, Miller KD, Jemal A. Cancer statistics, 2016. CA Cancer J Clin. 2016;66:7-30. National Comprehensive Cancer Network. Non-Small Cell Lung Cancer. Version 1.2016. http://www.nccn.org/professionals/physician_gls/PDF/nscl.pdf. Accessed August 17, 2016. Timmerman R, Paulus R, Galvin J, et al. Stereotactic body radiation therapy for inoperable early stage lung cancer. JAMA. 2010;303(11):1070-1076. Simone CB 2nd, Wildt B, Haas AR, et al. Stereotactic body radiation therapy for lung cancer. Chest. 2013;143(6):1784-1790. Chang JY, Senan S, Paul MA, et al. Stereotactic ablative radiotherapy versus lobectomy for operable stage I non-small-cell lung cancer: a pooled analysis of two randomised trials. Lancet Oncol. 2015;16(6):630-637. Simone CB 2nd, Dorsey JF. Additional data in the debate on stage I non-small cell lung cancer: surgery versus stereotactic ablative radiotherapy. Ann Transl Med. 2015;3(13):172. Verma V. Stereotactic radiotherapy versus surgery for early-stage operable lung cancer: more questions than answers. J Natl Compr Canc Netw. 2015;13:1293-1295. Verma V. Lung cancer: implementing lung-cancer screening – oncological ‘grey areas.’ Nat Rev Clin Oncol. 2015;12:256-257. Verma V, Zhen W. Treatment costs of early-stage lung cancers detected by low-dose computed tomography screening. Int J Radiat Oncol Biol Phys. 2015;93:207-208. Verma V, Beriwal S. Medicare approves coverage for lung cancer screening: the case for symptomatic screening. JAMA Oncol. 2015;1(8):1027-1028. Cuaron JJ, Yorke ED, Foster A, et al. Stereotactic body radiation therapy for primary lung cancers > 3 centimeters. J Thorac Oncol. 2013;8:1396-1401. Dunlap NE, Larner JM, Read PW, et al. Size matters: a comparison of T1 and T2 peripheral non-small-cell lung cancers treated with stereotactic body radiation therapy (SBRT). J Thorac Cardiovasc Surg. 2010;140:583-589. Grills IS, Hope AJ, Guckenberger M, et al. A collaborative analysis of stereotactic lung radiotherapy outcomes for early-stage non-small-cell lung cancer using daily online come-beam computed tomography image-guided radiotherapy. J Thorac Oncol. 2012;7:1382-1393. Allibhai Z, Taremi M, Bezjak A, et al. The impact of tumor size on outcomes after stereotactic body radiation therapy for medically inoperable early-stage non-small cell lung cancer. Int J Radiat Oncol Biol Phys. 2013;87:1064-1070. Woody NM, Stephans KL, Marwaha G, et al. Stereotactic body radiation therapy for non-small cell lung cancer tumors greater than 5 cm: safety and efficacy. Int J Radiat Oncol Biol Phys. 2015;92:325-331. Verma V, Shostrom VK, Kumar SS, et al. Multi-institutional experience of stereotactic body radiotherapy for large (≥5 centimeters) non-small cell lung tumors. Cancer. 2017;123(4):688-696. Verma V, Shostrom VK, Zhen W, et al. Influence of fractionation scheme and tumor location on toxicities after stereotactic body radiation therapy for large (≥ 5 cm) non-small cell lung cancer: A multi-institutional analysis. Int J Radiat Oncol Biol Phys. 2017;97(4):778-785. Tekatli H, van ’t Hof S, Nossent EJ, et al. Use of stereotactic ablative radiotherapy (SABR) in non-small cell lung cancer measuring more than 5 cm. J Thorac Oncol. 2017;12(6):974-982. Peterson J, Niles, C, Patel A, et al. Stereotactic body radiotherapy for large (>5 cm) non-small-cell lung cancer. Clin Lung Cancer. 2017;18(4)396-400. Huang X, Wang J, Chen Q, Jiang J. Mediastinal lymph node dissection versus mediastinal lymph node sampling for early stage non-small cell lung cancer: a systematic review and meta-analysis. PLoS One. 2014;9(10):e109979. Corso CD, Lloyd S, Harder E, et al. Invasive mediastinal staging does not improve outcomes over pet alone in early-stage NSCLC treated with SBRT. Int J Radiat Oncol Biol Phys. 2014;90:S216-17. Paravati AJ, Johnstone DW, Seltzer MA, et al. Negative predictive value (NPV) of FDG PET-CT for nodal disease in clinically node-negative early stage lung cancer (AJCC 7th ed T1-2aN0) and identification of risk factors for occult nodal (pN1-N2) metastasis: implications for SBRT. Transl Cancer Res. 2014;3:313-319. Schonewolf CA, Verma V, Post CM, et al. Outcomes of invasive mediastinal nodal staging versus positron emission tomography staging alone for early-stage non-small cell lung cancer treated with stereotactic body radiation therapy. Lung Cancer. 2017. 2018;117:53-59. King CR, Brooks JD, Gill H, Presti JC Jr. Long-term outcomes from a prospective trial of stereotactic body radiotherapy for low-risk prostate cancer. Int J Radiat Oncol Biol Phys. 2012;82:877-882. Jin H, Tucker SL, Liu HH, et al. Dose-volume thresholds and smoking status for the risk of treatment-related pneumonitis in inoperable non-small cell lung cancer treated with definitive radiotherapy. Radiother Oncol. 2009;91:427-432. Zhuang T, Huang L, Qi P, Yu J. Radiation therapy: clinical application of volumetric modulated arc therapy. Appl Rad Oncol. 2013;2(2):6-11. Holt A, van Vliet-Vroegindeweij C, Mans A, et al. Volumetric-modulated arc therapy for stereotactic body radiotherapy of lung tumors: a comparison with intensity-modulated radiotherapy techniques. Int J Radiat Oncol Biol Phys. 2011;81(5):1560-1567. Jiang X, Li T, Liu Y, et al. Planning analysis for locally advanced lung cancer: dosimetric and efficiency comparisons between intensity-modulated radiotherapy (IMRT), single-arc/partial-arc volumetric modulated arc therapy (SA/PA-VMAT). Radiat Oncol. 2011;6:140. Zou W, Yin L, Shen J, et al. Dynamic simulation of motion effects in IMAT lung SBRT. Radiat Oncol. 2014;9:225. Timmerman R, McGarry R, Yiannoutsos C, et al. Excessive toxicity when treating central tumors in a phase II study of stereotactic body radiation therapy for medically inoperable early-stage lung cancer. J Clin Oncol. 2006;24(30):4833-4839. Chen Y, Guo W, Lu Y, Zou B. Dose-individualized stereotactic body radiotherapy for T1-3N0 non-small cell lung cancer: Long-term results and efficacy of adjuvant chemotherapy. Radiother Oncol. 2008;88:351-358. Verma V, McMillan MT, Grover S, Simone CB 2nd. Stereotactic body radiation therapy and the influence of chemotherapy on overall survival for large (≥5 centimeter) non-small cell lung cancer. Int J Radiat Oncol Biol Phys. 2017;97(1): 146-154. Simone CB 2nd, Burri SH, Heinzerling JH. Novel radiotherapy approaches for lung cancer: combining radiation therapy with targeted and immunotherapies. Transl Lung Cancer Res. 2015; 4(5):545-552. Cohen J, Lin L, Feigenberg SJ, Simone CB 2nd. Proton therapy for lung cancer: current uses and future applications for early-stage and locally advanced non-small cell lung cancer. Appl Rad Oncol. 2016;5(4):12-18. Simone CB 2nd, Rengan R. The use of proton therapy in the treatment of lung cancers. Cancer J. 2014;20(6):427-432.
odiri A, Sabouri P, Gu X, et al. inversed-planned respiratory phase gating in lung conformal radiation therapy. Int J Radiat Oncol Biol Phys. 2017;99(2):317-324. Simone CB 2nd, Houshmand S, Kalbasi A, et al. PET-based thoracic radiation oncology. PET Clin. 2016;11(3):319-332. Menten MJ, Wetscherek A, Fast MF. MRI-guided lung SBRT: present and future developments. Phys Med. 2017;44:139-149. Post CM, Verma V, Zhen W, Simone CB II. Stereotactic body radiation therapy for ≥ 5 cm node-negative non-small cell lung cancer: Survey of U.S. academic thoracic radiat. Appl Rad Oncol. 2018;7(1):33-42. Mr. Post is a fourth-year medical student, Dr. Verma is chief resident, and Dr. Zhen is a professor, Department of Radiation Oncology, University of Nebraska Medical Center, Omaha, NE. Dr. Simone is an associate professor, Department of Radiation Oncology, University of Maryland Medical Center, Baltimore, MD.